Once a year, at the Great Vigil of Easter, sometime between sundown on Holy Saturday and sunrise on Easter Day, Christians in the Western liturgical tradition gather in churches and cathedrals to kindle a new fire from which a great candle representing the Risen Christ is lighted. That Paschal candle is carried into the midst of the faithful, and there a deacon or cantor sings an ancient prose hymn praising Christ the Light who dispels the gloom of sin and banishes darkness. This hymn, called the Exsultet, from the Latin “rejoice,” is one of the poetic treasures of the Church, dating back to at least the 4th century. The chant begins with an invitation for the heavenly host, the entire creation, Mother Church, and finally our own assembly to share in the rejoicing. In southern Italy, by the 10th-11th century, the text of this hymn together with the musical notation was written on long illustrated scrolls. As the deacon stood in the ambo (pulpit) elevated above the people and sang the chant, the scroll unrolled over the desk of the ambo and the gathered faithful could see paintings which illustrated the text. 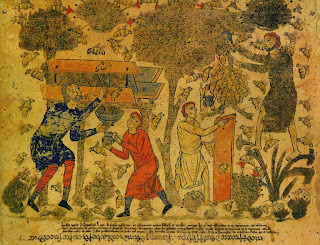 While the verses regarding bees were sung, those standing near the ambo saw a picture of people harvesting the wax and the honey from bee hives and nests. When the Roman Catholic Church restored the Great Vigil in the 1950’s and translated the official texts from Latin to English, the sections of the poem regarding the bees were retained. With revisions in 1970 the bees were dropped. Episcopalian scholars working on the current prayer book followed the Roman lead and when the Book of Common Prayer came out in 1976 the bees were not to be found. The latest Lutheran revision of the liturgy now includes the bees, and the new Roman Catholic translation in English of the Exsultet appears to have restored them once again. Many Episcopal parishes who celebrate the Great Vigil have used a form of the Exsultet chant published by Nashotah House, one of the seminaries of the church, which retains one of the lines from ancient sources regarding the bees. To bee or not to bee has obviously been a question amongst liturgical scholars. If one knows ancient Greek mythology, the restoration of bees to a chant at St. Paul’s is particularly appropriate. The name Melissa means “honey bee” in Greek! The word for honey in Greek is “mel” and it is from this root that we get the word mellifluous, meaning sweetly or smoothly flowing, honey-like. There is profound theological significance to the mention of bees. At the beginning of the Exsultet the whole creation is invited to rejoice. The celebration of the Resurrection occurs at a specific time of year in which (at least in the northern hemisphere) the natural world is undergoing rebirth and renewal. As sacramental Christians, we know that the “outward and visible” can be a sign of the “inward and spiritual.” The creation itself is a form of proclamation, visible evidence of God’s power to bring life from death! For too long humankind has abused and ignored so much of the creation. In every way possible the Church needs to assist her members in reconnecting with the earth and reclaiming a sense of responsible and caring stewardship for all living things. I believe that including a creature as small as a bee in our Easter rejoicing this year is a good thing, a tiny step toward making our prayers and faith more “green”. The Paschal candle which I ornamented this year includes a small sturdy bee - a token of all the creatures, great and small, who in their own ways share our rejoicing and make life on this planet possible and wonderful. Ralph Carskadden is a Priest Associate at St. Paul's. I remember hearing that line specifically and thinking, "How cool is that?! I go to a church that glorifies the Creator by honoring the creation." The Paschal candle itself is a new ritual for me, and so I was amazed at the 'barbecue' we got going that morning in order to light said candle. Between the heads and shoulders of the congregants I thought I saw Mother Melissa (a very hard working honey bee indeed) inscribe something on it. I wonder what that was all about. Does the Paschal candle burn until next Easter, or will these bees hibernate during certain seasons such as Lent? I think what you saw was Mo. Melissa inscribing the sign of the cross onto the candle. We'll have it up until the season of Easter is over, and then it will come out for special occasions like baptisms and whatnot until next year when we get a new one.